My now 18 month old son had 8 ear infections in 1 year, from the time he was 4 months old to 16 months old. At that point, we were walking a fine line and were told that 1 more and we would be sent to the ENT to discuss getting tubes. I really did not want tubes, so I dug deeper into my search for a natural preventative. The problem is my son has allergies, thus frequently has a runny nose. His ears would get infected and he would just be a mess. As far as antibiotics (which I hate to use) Augmentin did not work, we had used Omnicef so many times and he had a bad allergic reaction to Amoxicillin. So we were out of “traditional” options for treatment. I posted an inquiry for suggestions of ear infection preventatives and got several good suggestions. One suggestion was to take him off dairy. I promptly stopped giving him cow’s milk and switched to rice milk. Another suggested garlic oil drops in the ears, so I ran down the street to the natural/organic food store. The lady there suggested these homeopathic allergy pellets in addition to the garlic oil drops. These did seem to help, but one night I stumbled across a device call The EARDOC. It seemed too good to be true – non-invasive, no medicine – just a little device that vibrates and you hold it behind the ear for 1 minute. Dr. Sears highlighted The EARDOC on “The Doctors” TV show. With his seal of approval, I was sold that this may actually work. Plus, there were lots of great testimonials on the EARDOC website. The EARDOC is easy-to-use and pain-free. My son loves to treat himself with the EARDOC. About 75% of children up to age four suffer from earache caused by the accumulation of liquids and air in the middle ear. Swimmers, divers and air travelers also suffer from the same problem. The EARDOC is an efficient & proved non-invasive device that reduces the ear pain by treating the problem rather than the symptom. 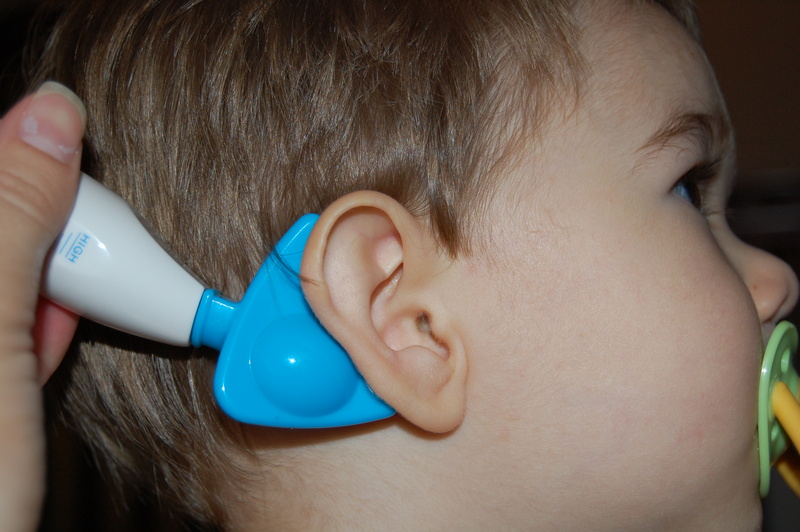 The EARDOC significantly reduces the need for ear tube surgery (Myringotomy) by naturally opening the closed Ear tube and drying the trapped fluids. The EARDOC has gone through clinical reviews and is found to be safe and effective at opening the ear tube and reliving ear pain. The folks at the EARDOC were kind enough to send me one to try and review, and one to giveaway (details at the end of this post). 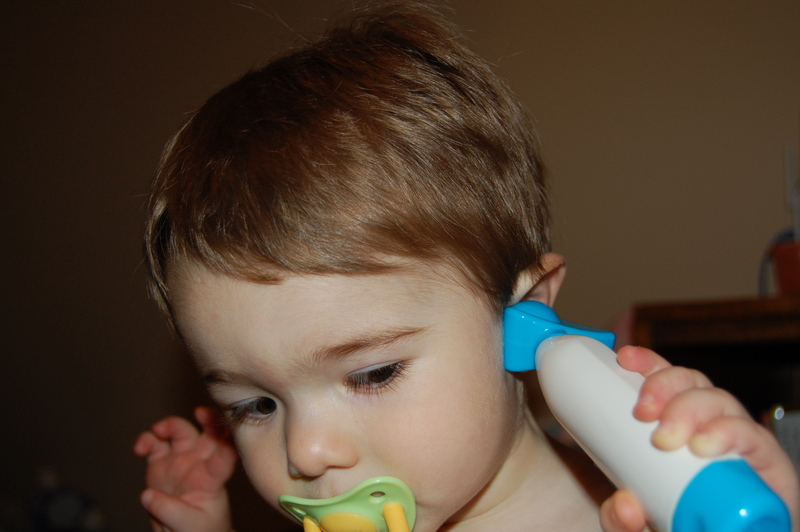 The first day I used the EARDOC, I am certain my son had an ear infection, or at least was in the beginnings of one. He had a runny nose and was waking once or twice at night (our only 2 indicators). That morning, he was pretty fussy and I knew he was tired, but he would not settle. I used the EARDOC for 1 minute on each ear, as directed, and he promptly fell asleep. My husband and I looked at each other in disbelief. The EARDOC is gentle and soothing. DS loves to use it. After day 3 of using the EARDOC, his nose was clear! What’s also amazing is he sat still while we used it on him. I expected him to squirm, but it seemed to relax him and he was more likely to balk once the treatment was over, rather than during it. He also wanted to use it on himself and treat me, his sister and his daddy as well. I also had a little ear pain during the same time, so I used it on myself. After a couple days, I no longer had any ear pain! The pain that I had off and on for a few months was gone. I am an EARDOC believer. My daughter also loves the EARDOC. She has no ear issues, but just likes the "ear massage." comfort level. 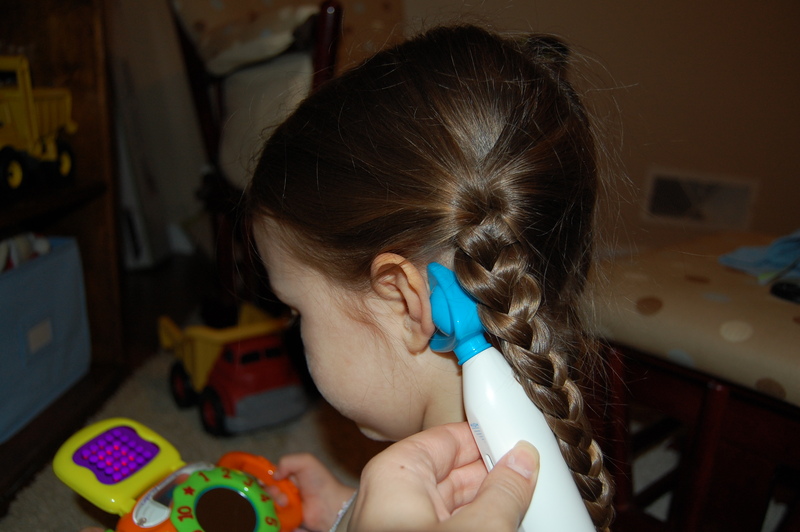 You can use on each ear up to one minute, but you can use as often as needed throughout the day. It’s been about 3 weeks since using the EARDOC. Yesterday was my son’s 18 month visit and as I suspected, we do NOT have an ear infection! Thank you to the EARDOC. I truly believe we would not have gotten such great news without it! Want one of your own? Enter our giveaway and ONE very lucky reader will win their very own EARDOC. Of course, the kids won't let us feel left out. 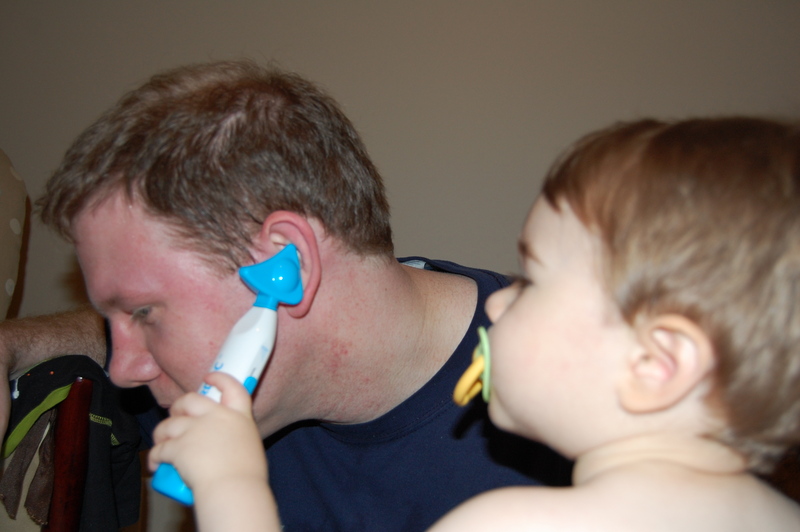 Here DS is using the EARDOC on daddy. Contest ends at midnight CDT on June 17th. Disclaimers: While the EARDOC is safe and effective, and can be used in conjunction with medication and if your child already has tubes, it is always wise to consult your doctor before any other treatment. The EARDOC was provided free of charge for review, however the views and opinions expressed here are completely my own. No other compensation was given.